I had a fabulous pair of books as a kid, Earthsearch and Explorabook, that introduced me to magnetism, light rays, bacteria, optical illusions, and all sorts of other cool stuff. One of the most memorable sections was about John Snow, a nineteen-century British physician. 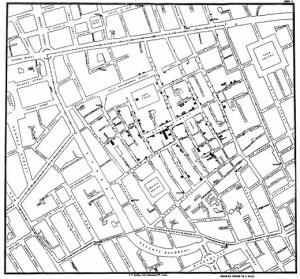 During the 1854 cholera outbreak in London, Snow mapped out the occurrences of infections and found they all centered around a water pump, leading him to believe contaminated water was the cause of the disease. He convinced officials to break off the handle of the pump, which effectively ended the outbreak. Now snow is regarded as one of the fathers of epidemiology. In a 2008 book, Irwin Sherman names cholera as one of the twelve diseases that have changed the course of human history. Some of the diseases he picks are important not only for the devastation they’ve caused, but also for the innovations that have led to their treatment. For instance, the fight against tuberculosis promoted the use of pasteurization and the search for antibiotics. Likewise, the science of vaccination was developed to combat smallpox. Other diseases are important for their sociopolitical effects, such as the genetic blood disorders of hemophilia and porphyria. Due to incestuous bloodlines, the Russian Romanov dynasty and Spanish royal families were overcome by hemophilia and died out. The Bolsheviks rose in Russia, and Francisco Franco took over Spain. Meanwhile, many British monarchs suffered from Porphyria, also known as the Vampire Disease, which can have neurological complications as well as the physical symptoms that gave rise to vampiric stereotypes (pronounced teeth, skin sensitivity to sunlight, an aversion to garlic). 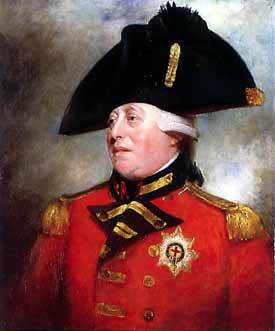 King George III was retroactively diagnosed with porphyria, which may explain his mental illness and the reason why he lost control over the New World. Epidemics are often caused by the movement of people and introduction of foreign flora and fauna to new environments. Thus, there is cause for concern with the ever increasing globalization of trade and the ease of foreign travel in the present day. However, we have also become ever more adept at treating outbreaks, at least in the developed world. Epidemics now seem to highlight the divide between first and third world countries. After the hurricane in Haiti, almost 5,000 people died from cholera due to poor sanitation–a problem that is both preventable and treatable. Though the sociopolitical implications change over time, disease will continue to shape our history and future.